When it comes to repurposing your garage for something other than storing junk and a few garden tools in , because let’s be honest, hardly anyone stores a car in their garage anyway,there are a thousand different things you can use it for. Especially if you live in a new build property where the garages seem to be built far too small for your even your average sized family car. 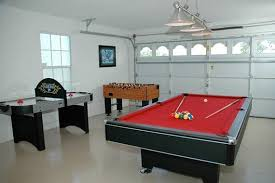 Once you have made sure that you have some light entering the garage through a window and that you have access through a fully functioning garage door, if you have any Garage Door Repair needs then look at getting these sorted asap, you can start thinking about what you want to use the space for. Here are some inspiration ideas to help with your decision. A home gym – if you are fed up of travelling too and from the gym and then having to wait to use the equipment why not convert your garage into your own unique home gym. Complete with just the equipment that you need. A second living room – if you have a growing family and a house full of teenagers you may be looking for a space of your own. Why not create a second living room all for yourself where you can retreat with your favourite book or catch up on your favourite television show, all within close proximity of the houses should anyone need you. Games room – if you would rather keep your old living room to yourself why not create a games space for your growing teenagers complete with a television, their favourite games consoles and a comfy sofa. You can relax in the house knowing that your children are able to enjoy some independent time with their friends whilst still being in the safety and comfort of your home. Workshop – if you are a keen craftsman then why not turn your garage into your own bespoke workshop where you can create the masterpieces of your choice. Whether this is woodwork or repurposing old furniture, the garage space will mean that you can really immerse yourself in your creative visions and keeps the messy equipment out of your home living space. Animal fostering – if you are an animal lover you may want to think of surrendering your garage space in order to be able to foster animals for your local rescue charity or animal shelter.